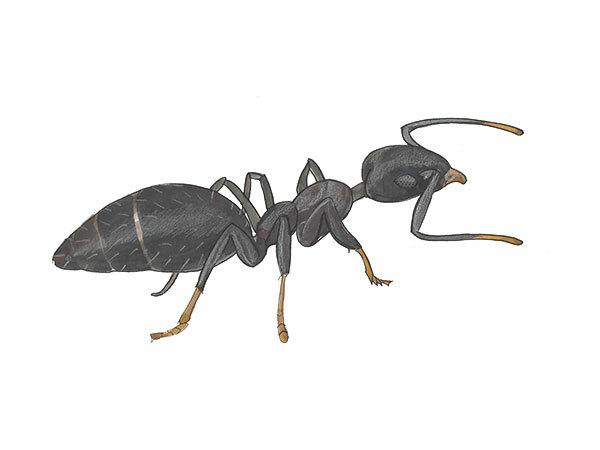 The white footed ant is black to blackish-brown in color. Only the feet and antennas are white, giving this ant a unique characteristic. The head is actually as long as it is wide and the body averages between 2.5-3 mm in length. White footed ants are believed to originate from Indonesia and now are one of the most notorious invaders of Florida. Their nests are normally found outside and most often off the ground, in trees or thick vegetation. Colonies can form inside hollow branches or at the base of palm trees. Nests can also be located in leaf piles, loose soil and loose mulch. Some colonies will create multiple nests leading to super colonies with over one million in population. When white footed ants infest homes, they will build nests inside wall voids, behind cabinets and inside foundations. White footed ants produce enormous colonies with multiple queens and hundreds of thousands of workers. These ants have incredible reproductive powers through swarming and budding. Swarming happens when winged reproductive ants grow wings and begin to fly, in search of new a mate. Once the two pair up and begin mating, a new colony is born. Budding happens when a group of queens and workers walk out of the colony and search for a new nesting area where they begin mating and create a new colony. White footed ants swarm between May and June in the Manatee and Sarasota County areas. Swarming and budding can be the result of an overpopulated colony. White footed ants prefer to eat sweets such as honeydew and nectar from flowers or insects. Mealybugs share a symbiotic relationship with white footed ants. Mealybugs produce honeydew, the top food source for white footed ants. They will protect mealybugs from predators while eating their sweet honeydew secretion. Mealybugs are a serious threat to agriculture; they destroy ornamental plants and a vast amount of farm crops. White footed ants also eat protein from animals, insects and reptiles. When indoors, they gravitate toward sweet items such as honey or sugar. The main concern with white footed ants is the sheer size of the colony. Once a white footed ant colony infests a structure, it can become challenging to eradicate. Eliminating all food sources should be the first step to control white footed ants. Place all open food items in sealed containers, keep countertops clean, and animal food stored away. White footed ants commonly enter homes from ornamental plants or trees touching the home, therefore manicuring the outside perimeter is advised. When treating for white footed ants, look for trails on the exterior of the structure. Trails often lead to nests. Treat the nest with either baits or insecticide and allow enough time for the treatment to take effect. If white footed ants have infested the inside a home and behind tight fitting areas, inject an aerosol or dust pesticide between the crevices to make contact. Finish with an outside residual spray around the perimeter of the home. Always read the label on all chemicals and baits before use. Contact us today if you are experiencing an ant infestation in your home. We are available to assist with ant control Palmetto, ant control Holmes Beach, ant control Bradenton and other areas. Cloud Termite and Pest Control has seen and dealt with every kind of ant control issue. Dont be afraid to call us and get rid of ants from home forever.